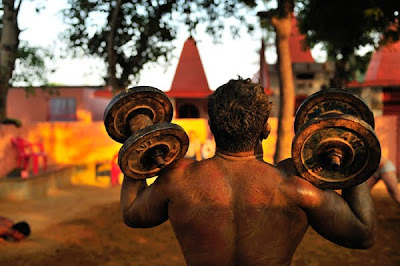 Akhara Kushti is situated east of Kailash in the neighbourhood of Gari in south New Delhi. Here some twenty 'Pehalvans' or wrestlers train under the watchful eye of Guru Charan Singh. Traditional Indian wrestling is a way of life that finds its roots in ancient India. Practitioners live and train together following the Spartan rules of the Akhara, practicing vegetarianism, celibacy and a strict avoidance of smoking and alcohol, the wrestlers concentrate on building strength and perfecting technique. The red soil pit where the wrestling takes place is sacred to the Pehalvans is mixed with oil and ghee and represents the very heart of India itself. They will only walk barefoot in the pit and footwear is strictly taboo. Less and less boys are turning up to train, as the life of a wrestler is a hard one with very few succeeding in making a living from competition. But despite that, there are still many Akharas left and some very committed people who are working hard to keep this ancient fighting art from dying. Darragh Mason Field was born in Dublin but grew up on the side of a mountain in the West of Ireland and went on to study Communications in Dublin City University, majoring in Photography. His portfolio can be viewed at http://www.darraghmasonfield.com. Weird practice. But the fact that such traditions still exist is actually great. This guy is crazy talented...I have been following him for quite some time. i am a fashionable man and i want to become a best photographer to click a more fashionable photos of wedding in Delhi.